Alaska glacier trekking, ice climbing, and glacier tours - family trips at Matanuska Glacier near Anchorage. Experience Alaskan adventure tours with Planet Earth Adventures. A truly Alaskan Adventure on the Matanuska Glacier. Discover the amazing Blue Ice, Crevasses and other unique formations. Stand on a high-point with amazing views of the great Ice Fall. Stand on 1,000 year old Ice. This is sure to be an unforgettable experience. 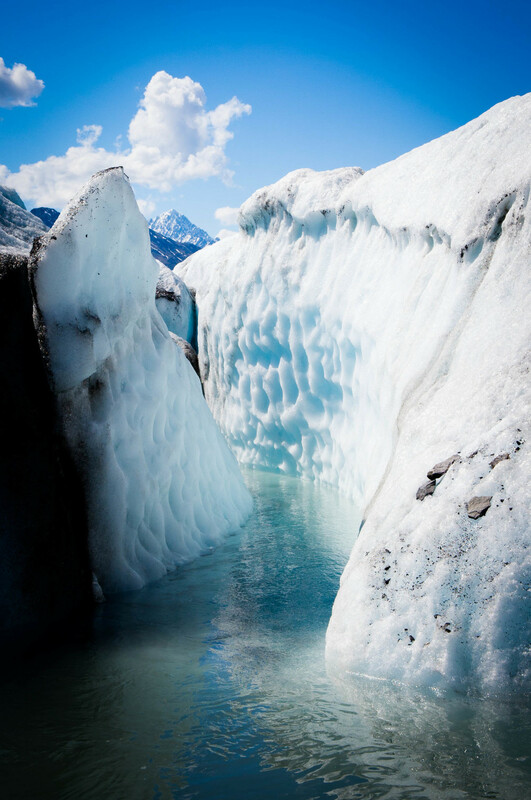 Glaciers are responsible for shaping and forming this great land, and Alaska has more than one thousand of these frozen rivers. 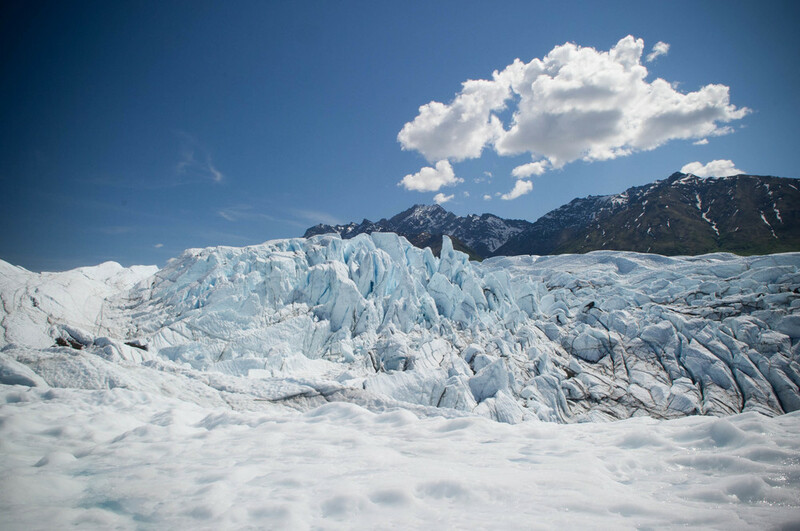 Since the Matanuska Glacier is so accessible, we help visitors explore this wonderful environment on many different levels. Our guides are chosen for their experience and their desire to work and play in bold environments. A zest for life and a caring attitude make all of us proud to share this unique Alaska experience. 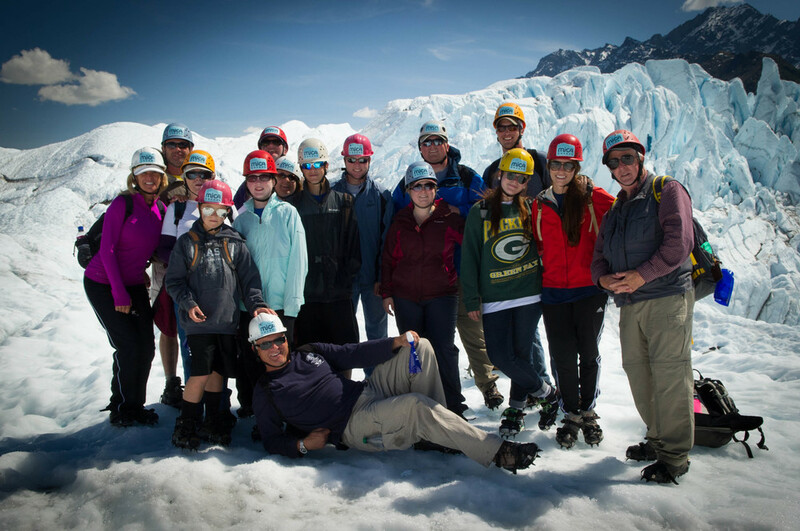 Glacier hiking is for virtually everyone! 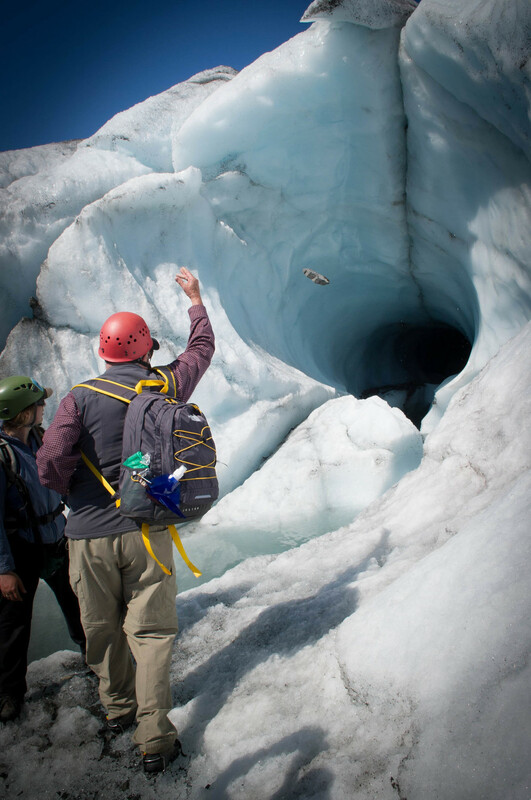 With proper equipment and an experienced guide, explore the hidden treasures of the Matanuska Glacier. 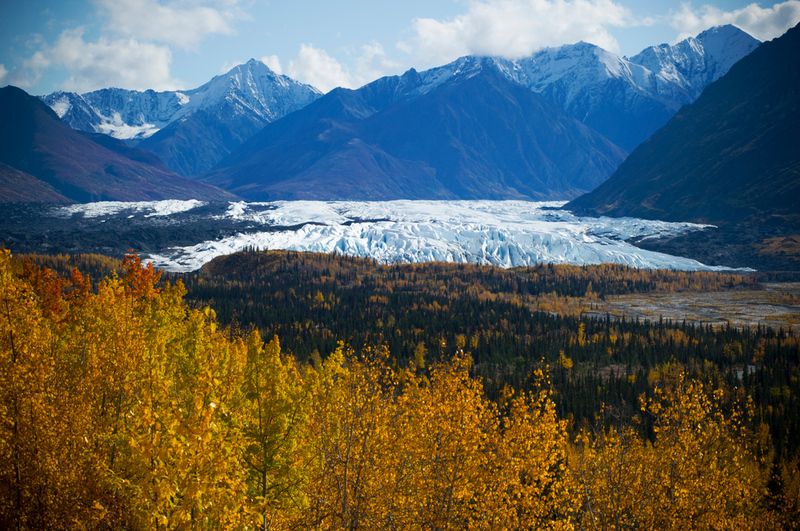 The Matanuska Glacier is one of the few Alaskan glaciers accessible by car. It is located 2 hours NE of Anchorage. With just a short hike, you can be standing on an enormous river of ice, exploring the natural wonders of the majestic glacier. Glacier hiking is an all weather activity. However, when the weather is bad in and around Anchorage, it is often sunny on the glacier. This is due to a phenomena in which the cold air off the glacier forces the warm valley air upward and into the surrounding peaks causing a weather hole. So come to the sunny Matanuska Glacier for an unforgettable experience. Matanuska Glacier Ice Fall Trek - 3 Full Hours on the Ice! Our most popular hike, featuring close-up views of crevasses, seracs and unique ice formations. With the use of crampons, you'll enjoy trekking to a high point on the glacier which overlooks the ice fall as well as getting up close. The glacier is in a constant state of change, and your guide can point out various features as you navigate the intense surface. This is sure to be an unforgettable experience. No experience necessary. Minimum age 8 years. Length of this Hike: Approximately 3 hours. Prices subject to change without notice. Please inquire at time of booking. Prices are per person, includes round-trip transportation from the Anchorage area. We do not stop for lunch. Please bring heavy snacks and water with you. This tour returns to the Anchorage area between 5 - 6pm. This activity is guided by our partner MICA Guides. What is the weather like on the glacier? The weather varies quite a lot around here. In general, it is about 5-10 degrees cooler down on the glacier. There is not an accurate forecast for the area, so don’t worry about checking the weather ahead of time. The weather can and does change quickly so we recommend being prepared for both rain and shine. What if it is raining on the day of my trip? Our trips go out rain or sunshine. We ask that you come prepared with a rain jacket and possibly rain pants, for a comfortable experience on the glacier. If you do not have these items, we can provide you with our rain gear at no additional fee. There are inherent dangers on the glacier, and anything could happen out there. Our guides are highly experienced and trained to spot these dangers and manage risks appropriately. How many people will be on our trip? We try to keep the guest to guide ratio at 6 or 7 guests to 1 Guide. If there are more than 6 people in the group, we may send another guide on the trip. Can I bring my camera out on the glacier? What should I wear for the Ice Fall Trek? Quick dry or hiking pants and extra warm layers are suggested. You must wear long pants, no shorts. Even if it is not raining, we suggest bringing rain gear as the weather can change any time. Bring thick socks that come up over your ankle and your own hiking boots that come above your ankle. Also bring snacks, water and a small day-pack if you have one. Keep in mind that this hike will carry over lunch, so please make sure you bring snacks along. There will be an option to eat lunch after your hike at a nearby restaurant. What if I don’t have hiking boots? If you are going on the Ice Fall Trek and don’t have a pair of hiking boots which fit at or above your ankle, we will lend you one of ours. For Ice Climbing trips, we will lend you a pair of our ice climbing boots. Do I have to pay extra if I borrow your boots or other gear? What can I expect on this hike? Watch the two minute video below . . . NOTE: THIS VIDEO SHOWS THE TYPE OF TERRAIN ON WHICH YOU WILL BE TRAVELING BUT NOT NECESSARILY THE EXACT ROUTE WHICH WE WOULD BE TAKING. THE GLACIER AND THE TERRAIN ARE CONSTANTLY CHANGING AND WE CHANGE AND ADJUST OUR ROUTES ACCORDINGLY AS NEEDED. Tour Cost: $249 per person. Minimum Age: 8. Please bring water & heavy snacks (this activity will carry over lunch) We return to Anchorage by 5pm. All groups are subject to a minimum group size in order to depart. A MasterCard or Visa is required to make your reservation online. Your card will be charged when you book your trip. We require at least 48 hours notice for cancellations otherwise a cancellation fee of 50% may be charged. No-shows or cancellations with less than 24 hours notice will not be eligible for a refund. Late arrivals that miss the departure will be considered a no-show. *Hike start/stop dates vary, please call us if you have questions.